A Bristol native, George “Jocko” Yarde was a man who lived life and loved sports, participating as an athlete, coach, promoter and sponsor. 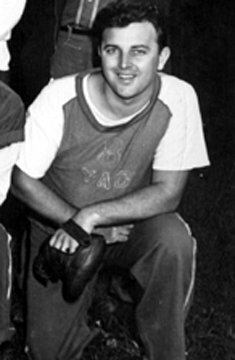 A member of the class of 1940 at Bristol High School, he played three years of basketball, four years of baseball and managed the school’s football team for four season. He went on to play baseball in the Canadian-American League before travelling with the famed and “bearded” House of David baseball club. Drafted into the Army, he helped lead the B.T.C. #10 Tech-Hawks out of Greensboro, N.C., rated No. 1 in Army baseball in 1943-44, to a 17-1 season. He coached the Bristol American Legion baseball team to a state title in 1952 and held stints as commissioner of the State Semi-Pro Baseball League. He was owner of the Bristol Baseball Club and Bristol Gears, a member of the New England Basketball Association, and arranged for many well-known pro athletes to speak at local banquets.